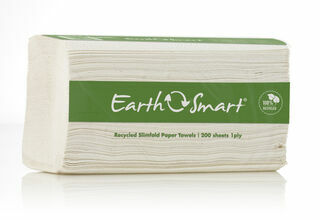 Earthsmart range of paper hygiene products are made from recycled paper. These include toilet paper, paper towels both slimfold and centrefeed. Slimfold (2 fold) Paper Towels are made from 100% recycled post consumer waste.